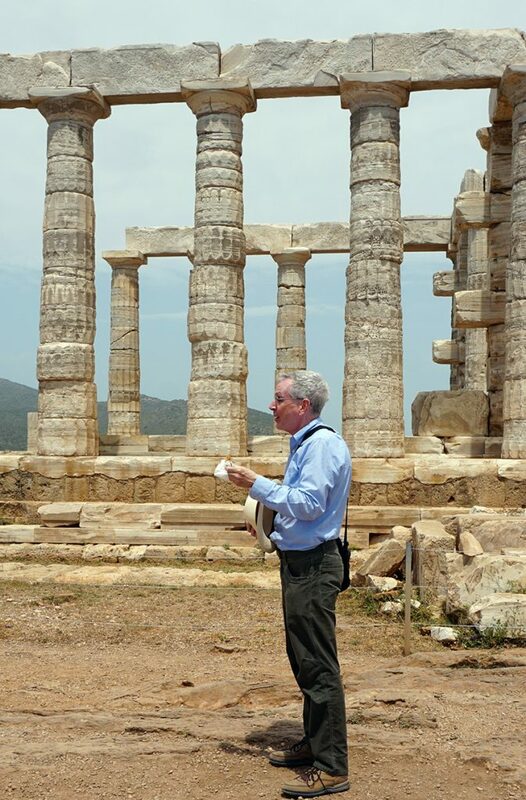 I’m at Cape Sounion, near Athens, visiting the Temple of Poseidon. In ancient times its splendid white marble columns were visible from far at sea and it was a very welcome landmark for sailors returning to Athens. The surviving columns and base are still an impressive sight. Poseidon has been kind to California recently, blessing us with some delightful rain this last winter. I wanted to show my appreciation to the god, so I had brought a small offering to the temple, a box of baklava. I ceremoniously thanked the god for his kindness and then offered up the baklava. Following tradition, after the god had had a moment to consume the essence of the offering, I then disposed of the physical remains. It was delicious. The site guard seemed mildly puzzled by all this, but wisely decided to let it be.